As a taxpayer who has lived in Grover Beach for 20 years, and a fiscal conservative, I am disturbed by the movement to convert our city to a new “charter” form of government. Since our city was founded, it has operated perfectly well as a “general law” city. That mean that we’ve been governed by provisions laid out in the state constitution that prevent deficit spending and caps pay for politicians – among many other examples – that work to protect taxpayers from the risks of out-of-control spending. Charter advocates claim that a move toward this form of government will save us money, but all of the facts prove otherwise. The process of holding an election to change the charter is a huge expense on its own, not to mention the hundreds of thousands of dollars campaigns and special interests on both sides will spend – flooding our mailboxes and making unwanted dinner time phone calls to convince us how to vote. We voted on this before. Lawsuits pitting the city against the state as the lawyers wrangle over what constitutes a ‘municipal affair.’ This could go on for years, consuming finite resources that could be spent to create jobs or repair our streets. Because the proposed charter could allow deficit spending, the city might spend beyond our means, increasing the likelihood that we could end up like Vallejo, Vernon and Bell – charter cities whose elected leaders spent them into a hole – in some cases leading to bankruptcy. Now, consider the fact that even if our elected representatives acted responsibly and stood up to the special interests, those out of town special interests could still gather signatures and put bad ideas on the ballot – hoping that if they spend enough money, they can convince us to give them our tax dollars. If they were successful, we could end up spending millions of dollars that we don’t have, or be saddled with a bad development because voters can become so confused by the propaganda that they vote for something they didn’t want. A recent report by the Los Angeles Civil Grand Jury showed that charter cities are far more likely to be in dangerous financial situations than general law cities. In their study, they found that among the 22 charter cities studied, only 5 had balanced budgets, in the ’09-’10 fiscal year. They further note that these charter cities were far more likely to make risky investments, and many lacked a competitive bidding process for taxpayer funded projects. Arroyo Grande and Grover Beach have functioned just fine for more than a century. The elected officials who came before our current crop were able to build our area into a great place to live and raise a family. There is no reason the current council can’t do the same with our existing laws. I encourage you to research this issue and its pitfalls and join me in opposition to this risky, unnecessary and expensive direction. Walt French has lived in Grover Beach for 20 years and is the Business Manager of the Plumbers and Steamfitters, Local #403. I, like Walt French, am a member of loc. union403. Walt gave his opinion about the Grover Beach Charter City proposal and the main response to the article is about prevailing wage. I agree with Kevin Rice that Prevailing wage is the most important issue to organized labor when it comes to Charter Cities. California labor laws and prevailing wage helps keep California’s work force strong. It promotes Apprentice and Journeyman training. It protects our local contractors by providing an even playing field when bidding public works projects against out of town contractors and creates local middle class jobs. I’ve read the opinions of Kevin Rice, aft50s and sloheadinsand. The mayor of Arroyo Grande and City Council member Bill Nichols has made similar claims to the amount of money that would be saved by eliminating prevailing wage, somewhere between 30-50%. Both Arroyo Grande and Grover Beach city Attorneys said at the council meetings that the non prevailing wage rate is about 30-35% less then the prevailing wage rates for construction workers in SLO County. I agree with this. Hourly pay and benefits for construction workers make up less then 25% of the total cost of the average construction job.This means by cutting wages by 30-35% you save 30-35% of 25% which is a total job savings of 8-12%. With the elimination of prevailing wage we see 80% of public works contracts go to out of town contractors with out of town workers. We lose local middle class construction jobs and the money earned on these public works projects are taken out of the community by the out of town workers. Even with prevailing wage in place, look what happened with the Los Osos sewer plant. Without prevailing wage in place this would be a common occurrence with our public works projects. We need to protect our public works projects, our local contractors and the local jobs they create. Prevailing wage is not just a union issue. Organized Labor makes up about 14% of the construction industry. There are hundreds of nonunion workers that work on SLO county public works projects each year. I urge all contractors and employees in the construction trades to contact the Grover Beach and Arroyo Grande City Council Members and oppose them eliminating prevailing wage in their Charter City proposals. Prevailing wage requirements are the downfall of our economy…along with environmental regulations. While they contribute somewhat, corporate welfare (subsidies, special tax breaks, regulations written by corporate puppets to favors certain specific companies) do as much or more to cause economic problems. Free trade agreements that ignore the effects of unfair differences in workplace safety and environmental regulations have done more to destroy American manufacturing and the blue collar basis for a middle class than the regulations themselves. They have also been used to negotiate away important laws such as the Glass-Steagal Act which would have greatly reduced (possibly eliminated) the recent economic disaster by limiting the ability of banks to make wild speculatory investments for short-term gains. How many trillions did we pay in bailouts so that the investment community didn’t completely collapse as they claimed they might? Did the individuals responsible for their bad decisions suffer any major consequences? Can you spell “Subtle Blackmail”? “Legalized Bribery”? Yeah, prevailing wages can be excessive but their significance in the overall economy is greatly exaggerated by the media mouthpieces for mega-corporate interests. Personally, I am more concerned about the power of public employee unions as there seems to be less of a limit upon their unrealistic financial expectations. As for environmental regulations, there may be a few that are excessive there too. But most are a case of spending now to prevent bigger costs later in the form of health costs. The same media mouthpieces that criticize unions are happy to take the few regulatory excesses and use them to condemn all regulations no matter how beneficial they are. The main difference this will impose on the common people (mere residents) will be that of jurisdiction in regards to the current Grover Beach Municipal Code (http://www.grover.org/index.aspx?nid=77). General Law cities such as Grover Beach, at the moment shall operate under the general California state law and constitution even with regards to its own Code, if at anytime it is in conflict with the General Laws of California, then these general/common laws and constitution of California prevail. If Grover Beach municipal Corporation is given the power through State of California corporate charter than it will essentially move to have final governing power over anyone that identifies themselves as “residents” (or employees to the city) within that municipality. Thus giving the municipality greater control through its code over all affairs. A municipal city/corporation with a state charter generally confers more benefits to “employees” rather than the mere “residents”. The Municipal City of Bell is a STATE charter city as of 2005. What kind of City is Bell, Ca.? These are the other 120 charter cities. Are they all like Bell? WOW! This is a bunch of gross overstatement and white noise designed to frighten. What this is about is unions—like the one Walt is associated with—are concerned that under some very specific circumstances a city can opt out of paying “prevailing wage” for jobs. Walt French was treasurer of “No on Grover beach I-12” two years ago. Assistant treasurer was Cory Black who is/was behind Adam Hill, Caren Ray, Tommy Gong, and many others. In other words, this “opinion” is pure political scam, not a rational viewpoint. EVEN THOUGH a prevailing wage opt-out isn’t even part of the Charter that Grover is considering, the unions are trying to “blow it up” just in case—exactly like they did in 2012 when they killed Measure I by a mere four votes. That’s right. Four votes. Has anyone heard the unions being concerned with SLO City having a balanced budget and lowering their public employee pension debt? OF COURSE NOT. Grover is in particular need of new streets, which is an extremely expensive endeavor because the original pavement was placed right over loose sand instead of proper road base. If Grover residents hope to ever have decent streets (without foot-deep potholes in some places), then supporting a charter is important to look at. “hundreds out thousands of dollar campaigns” – RIDICULOUS! The opposition led by Walt in 2012 reported a mere $4,369 in spending two weeks before the election. “unwanted dinner time phone calls” – Non-existent in 2012. Simple sham argument to keep something off the ballot for fear of a phone ringing. And the best one…. “the special interests” — Yeah, Walt! Like your organization? Is Plumbers and Steamfitters, Local #403 a special interest? OF COURSE IT IS! Grover residents should examine the ACTUAL MERITS of a charter, not be frightened by “the special interests”. I was paying attention until the very end when I learned what Walt does for a living. It became very apparent very quickly why long time resident Walt is so concerned about-prevailing wage. Walt makes his living from union dues, and while he didn’t mention it in his blurb, Charter Cities, in certain circumstances, can opt out of paying prevailing wage rates. While I have nothing against unions (I worked out of the SLO Carpenters Hall for about three years) until I realized I could make more money to support my young family by not being union, it doesn’t make sense to me why a city, and ultimately the tax payers, should be saddled with paying higher wages than a private entity does for the same exact type/quality of work. Currently a “journeyman industrial plumber” makes $40.57 per hour ($80K a year) plus another $23.84 per hour in vacation/holiday/health/welfare/pension for a grand total of $61.41 an hour. And don’t forget the $1.61 per hour increase that will go into effect in June 2014, which equates to an added 4% raise. Is anyone reading this guaranteed a 4% cost-of-living raise for the next four years, other than the trade mentioned and government employees? Now I could be way off base here, but I would suspect that the average wage of the working class in our town is much less than the wage shown above, and I would also suspect that there are residents here who are as qualified as a “journeyman industrial plumber”, who would be happy as hell to go to work for $30 – $35 / hour plus an additional $20/hour. I know if I was younger I sure as hell would be. As for Walt’s inclusion of the LA Grand Jury Report, I am confident that someone else could dig up 22 other cities somewhere in California that did have balanced budgets for the same time period referenced. So residents of Grover Beach, think about this… if there was only a finite amount of money to spend ever year on our streets, and by not paying prevailing wage the City could pave an additional 30% every year for the same amount of money, what will you say at the polls? Walter French states he is a taxpayer who has lived in Grover Beach for 20 years, and a fiscal conservative. What he really is, is the Business Manager of the Plumbers and Steamfitters, Local #403. In other words he is in a UNION. A SPECIAL INTEREST GROUP with ONE very specific agenda item. This is the only thing that he and his out of town cronies care about, but spew all these other outright lies about deficit spending, risky investments, etc. Did you know that once the initial charter is accepted by the voters it CANNOT be majorly changed without the consent of the voters. Did you know that San Luis Obispo and Santa Maria have been charter cities for years. And Mr. French says he doesn’t want another ballot measure on this issue. It lost last time by only 4 votes due to the gross misleading and lies in mailers conceived by out of town special interests. The very factions that Mr. French so hypocritically is afraid of. And the added expenses of the election is NOT. There will be city council seats and mayor coming up on the November ballot. In the last election the union ran their local candidate, Louis Robles, for city council who was so very concerned about Grover Beach government. As far as I know he never attended a council meeting before the election and has never attended one since. Bottom line is that at the moment Sacramento (Jerry Brown and his union backers) is trying to mandate that is a charter city does not pay prevailing wage then most state aid will be withheld. The unions are afraid that if the winds in Sacramento shift on this issue they won’t get the union bid contracts. You know, the guys that hold the stop signs at $33 an hour. The unions claim they do better work. The Oak Park Blvd. improvement was a union prevailing wage job… how’s that working out? The streets in Grover are eventually going to have to be totally redone at a very rough estimate of $40 million for union prevailing wage as opposed to $25 million for local wage. 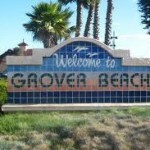 And most of the laborers in Grover Beach are NOT union and Grover should be about its own citizens. IGNORE ALL THE SMOKE AND MIRROR RHETORIC – IT”S ALL ABOUT PREVAILING WAGE!